In the Window or Anywhere Else. When buying a home or even an used car, many people seek out the assistance of home inspections and documents like CarFax. Well they should, purchases like homes and cars are of long term importance. Who would dream of paying full price for an appliance without getting assurances like warranties? Very few. When it comes to our beloved companions though, this rationale goes out the window even though, ideally, we have that pet longer than our home or car in today's society! Research is critical to make the experience both pleasant and responsible. "The emotional aspect of a pet causes many people to unconsciously perpetuate the problem of puppy mills and other irresponsible breeders." Julie Hensley, trainer/rehabilitator for over 20 years and developer of www.DigitalDog.com notes. "It's so easy to fall in love with that dog, then even if they find out that the breeder or current owner of the dog is less than ideal, it just increases their desire to 'save' that dog. Instead, they are assuring that there will be many, many more such dogs as the bad breeder continues to produce their product for anyone that will pay the price and those people are typically left with an animal that will have higher than usual temperament issues and/or health problems." How can all of this be true? And how can asking some basic questions help you with finding a well reared companion dog while additionally helping you avoid participating in this cruel industry? By knowing the level of responsibility that your breeder maintains, you can do both of these things. This basic list of questions (others and more specific questions would be in order when reviewing a specific breed) allows you to assess where the breeder falls on the questions of rearing, interest in the breed, seriousness as a student of the breed, knowledge of health issues, training, health clearances and more. It also helps you realize that it is entirely appropriate for you to seek evidence through documentation (such as health clearances, contracts and agreements) and references (such as other puppy buyers) for such assurances. As a final, but critical note. If you are considering a dog and the person or source of the dog (be it a person, store, or online) says they don't know or they didn't breed the dog. Walk away! As difficult as it may be, you've just discovered a broker. As appealing as you find that little face, would you have been able to have the litter in your home and then just send them off with someone else to find their forever homes? This may be the ultimate tragedy of the backyard breeder, puppy mill, puppy farm or whatever colorful term you prefer, they care so little. If they care so little, how can you be sure that they cared enough to do it properly. The fact is, they didn't and probably didn't even know HOW to do it properly if they'd wanted to. Using the questions below should open a communication between a good breeder and prospective home that would last the lifetime (and beyond) of their dog. Below each question is analyzed and assessed so that you can consider the quality of the answer you received and whether more research is warranted. Obviously all this information is only helpful if you verify it. So be prepared to do what is necessary, call other breeders, references, check lists of membership/donors, check health and breed registries and more to verify that what the breeder has told you is true. By the same token, avoid the breeder that doesn't ask you some tough questions and expect to be scrutinized a similar way with calls to your vet, references, etc. If you were turning over a beloved puppy to someone that was essentially a stranger wouldn't you want to verify that they were everything they claimed to be? Finally, just walk away from a breeder that won't accept payment in the form of a check but does take a credit card. This is just another indication that they are breeding too much and not screening homes closely enough. Otherwise they would feel comfortable in taking a check from a prospective home since they'd recognize them as responsible. If they don't recognize that virtue in the prospective home, what are they doing placing a dog with them? 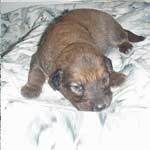 Below are the questions offered in virtually all of the breed profiles. If you aren't sure of the answers you are looking for, you'll want to review what we have to say about them as well as running them past any resources you might have (your vet, local folks involved in rescues, responsible breeders you know even if they don't breed the breed you are considering) to help recognize a good answer. If you still have questions, feel free to go to DigitalDog's Forum to post a specific question and get more information. - How long have you had the breed in question? - Why do you have the breed in question (show, performance, hunting, etc.)? - What do you consider to be the most important single characteristic of an example of this breed? - What health issues have you seen in the breed? - What criteria do you set for your breeding stock? - Do you plan to keep a puppy from this litter? - How often do you have puppies? - Do you have a written contract and puppy guarantee? - At what age do you send your pups to their homes? - How would you describe the ideal dog of this breed? - How would you describe the ideal home for this breed? 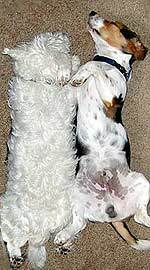 - Are your puppies whelped in your home? - What advice would you offer someone in raising and training a dog of this breed? - How do you assist or help this breed when in need of rescue? Of course, any additional questions you might have in evaluating a breeder can be fielded at the DigitalDog Forum. We'll be glad to see you there! Dig under fence - why?